Promotion represents all of the communications that a marketer may use in the marketplace. Like marketing mix, promotion has its own ‘ingredients’ to customize your strategy. Personal selling is an effective way to manage customer relationships. Sales personnel act on behalf of the producer/manufacturer. These sales personnel tend to be well trained in the approaches and techniques of personal selling. However sales personnel can be very expensive and should only be used where there is a good return on investment. Sales promotion on the other hand, tends to be thought of as being all promotions not including advertising, personal selling and public relations. Examples of sales promotion are BOGO (Buy One, Get One Free), couponing, dollars-off promotions, competitions, free accessories, introductory offers and other methods. Each sales promotion should be carefully compared with the next best alternative. Public relations is the deliberate, planned and sustained effort to start and maintain goodwill between an organization and its public. It is relatively inexpensive in comparison to other promotion methods, successful strategies tend to be long term and plan for all possible outcomes. Direct mail is another element of promotion mix. It is very highly focused upon targeting consumers based on a database. The mail is sent out to potential consumers and responses are carefully monitored to maximize ROI (Return on Investment) both short and long term. One example is using subscribers to a Cat magazine would definitely be more likely to buy cat health insurance than non-cat owners. Participating in Trade Fairs and Exhibitions are very good approaches for making new contracts and maintaining old ones. Companies will seldom sell much at these events, but it aims to increase awareness and to encourage trial of their products. Trade fairs and exhibits offer the opportunity for companies to meet with the distributors and end users. Advertising is a paid for communication. Newspapers, magazines, journals, television, movies, radio and the internet are used to spread the information. The images, words and feelings help to develop attitudes, create awareness, and transmit information in order to gain a positive response from the target market. Sponsorship is where an organization pays to be associated with a particular individual, event, cause or image. For example, ROLEX sponsoring the US OPEN or PEPSI sponsoring the SUPERBOWL. The target market relates the positive aspects of the sponsored individual/event to the sponsor. WARNING: Negative aspects can also be transferred, so choose wisely. Just like a cake mix, the ‘ingredients’ of the promotional mix are then integrated to form a unique but coherent campaign. 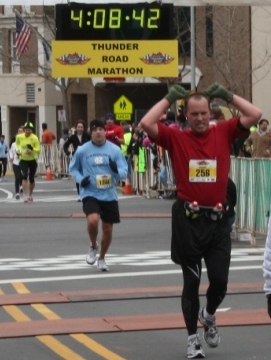 Yesterday (12/12/09) I began the Thunder Road Marathon in Charlotte, NC at 7:50 AM. After 4 hours, 7 minutes and 24 seconds I crossed the finish line. While not a fast time, it is not a slow time either. My main goals were to finish under 4 hours, 15 minutes and the bigger was was to just finish! That’s me above in the red (#256), the time shown above is the gun time, my chip time was 4:07:24. I have spent many an early day, waking up at 5:00 AM to run for 2-3 hours, shower, change, go to work and then sometimes class, church or put the kids to bed. Am I tired and sore? Yes and Yes, but mostly sore right now. There were many people along the route cheering runners along and every two miles there was water and Powerade offered to help refuel runners. Miles 16 and 20 also had energy gels, which really were needed to help give you the energy boost needed to keep going. I really need to thank my wife for the many morning of encouragement of kicking me out of bed. She got me going last Christmas when she got me a NikePlus to plug into my iPod. Then after some running I got Plantar Fasciitis, basically a lot of pain in my foot. I got new Saucony shoes and the pain went away, I have been running on Sauconys since 1991. I ran a number of 5k races, along with a 10k and 15k race as milestones along the journey. Did I always feel motivated? NO. Sometimes I just wanted it to be over, but I’m glad I did it. I now have a 26.2 magnet on my car, one of the gifts from my wife. Another great gift was chocolate covered almonds. Thank you to Melissa, Jesus, my girls, friends and coworkers that kept me going. I’m not sure what my next goal is yet, I need a few days to heal. Do you have anything you are working towards? What are your goals? Without goals, whatever you are doing can be pointless. Goal setting is a powerful way to increase motivation about your ideal future, and for turning your goal into reality. I didn’t just roll out of bed one morning and decide to run the half marathon; I have been running for awhile. I mentioned before that my wife got me the Nike Plus to track my running for Christmas last year. Since then I have been running 5 kilometer races and will run a 10 kilometer one this weekend, and have a 15 kilometer one scheduled for next month. 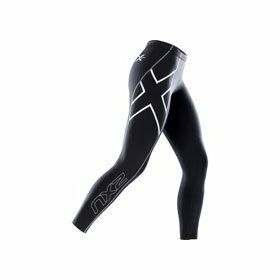 Recently I purchased some compression tights by 2XU to give better knee support, help my muscles to stay warm and to reduce fatigue. Just this morning I ran 10 kilometers in my neighborhood as part of my training routine and I shaved off two minutes wearing the compression tights. My wife says it was all mental, I can partially agree with her. But whatever it was, I ran two minutes faster.